The final movie in the Twilight franchise? Author Stephenie Meyer has said there’s a possibility of more books, so never say never. But in the meantime, The Twilight Saga: Breaking Dawn — Part 2 is the end. Of course, on DVD, Blu-ray and digital download, the end is available anytime. Breaking Dawn — Part 2 takes off where Part 1 ended, with the birth of Bella (Kristen Stewart, Snow White and the Huntsman) and Edward’s (Robert Pattinson, Cosmopolis) vampire child bringing conflict between Bella and werewolf Jacob (Taylor Lautner, Abduction), the third in the paranormal love triangle. 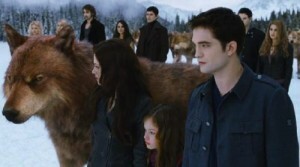 The fast-growing child also spawns an all-out war between the Cullens and the ancient vampire Volturi. Part 2 grossed a tidy $290 million in domestic theaters. No surprise, given the success of the previous films in the franchise. And critics liked Part 2 better than Part 1, even though reviews were still lukewarm. As Rolling Stone critic Peter Travers said of the PG-13 movie, “You’re going to hear a lot about Breaking Dawn — Part 2 being the best of the Twilight movies. That’s like saying a simple head cold is preferable to swine flu.” So, view at your own risk. digital copy and instant streaming via UltraViolet. The Twilight Saga: Breaking Dawn — Part 1 Extended Edition also is available on DVD and Blu-ray.